AS Central Sport got their debut OFC Champions League campaign off to a dream start after they came from a goal down to defeat fellow first-timers Madang FC 7-3 in the opening Group A match this evening. Hosts AS Magenta scored early and had to put maximum effort into their opening match in order to secure a 2-1 victory over Samoan side Lupe Ole Soaga in the night’s second encounter. “Of course we are pleased to win the first game and to mark the occasion of the club’s first game in the OFC Champions League with a victory,” Central Sport coach Cyril Klosek said. It didn’t commence as easily for the Tahitian side as the score line might suggest however. Within a couple of minutes of the opening whistle, referee Campbell-Kirk Waugh was sounding it again and pointing to the penalty spot after a foul in the area. Vanya Malagian stepped up to open the scoring and hand Madang an historic goal of their own. It took Central a bit of time to settle into the match as the fast-paced direct style adopted by Madang saw them take a cautious approach. 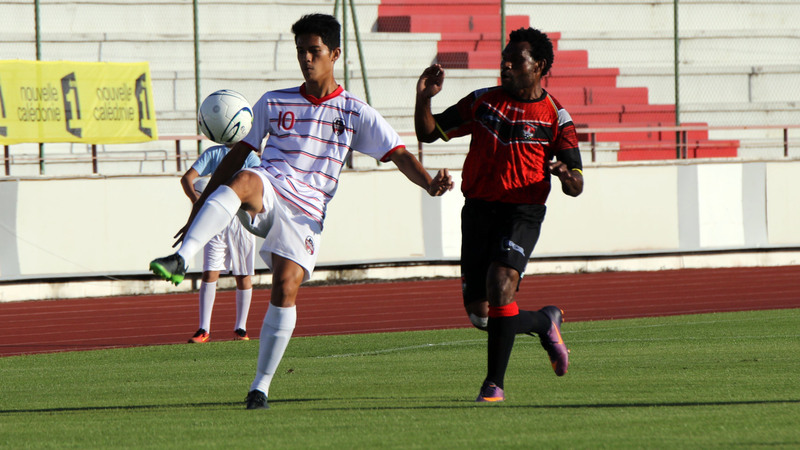 In the 38th minute things took a positive turn for Central as Chilean import Cesar Castillo sent a solid strike past a diving Glen Agat. Just ahead of the break one minute of play triggered a turning point in the match as Jacob Sabua was cautioned for a foolish tackle on Castillo on the edge of the Madang area. Matatia Paama delivered a perfect cross to an unmarked Diego Cifuentes at the far post who gave his side a one goal cushion. Four minutes after the restart a second yellow card was picked up by Sabua leaving Madang with over 35 minutes of football to play with a man down. The floodgates opened in the 56th minute as two goals in the space of two minutes, courtesy of Castaillo and Sergio Sandoval doubled their lead. Substitute Fred Tissot got on the board only minutes after coming on. Against the run of play, Madang managed to pull one back through Eliuda Pohei but Central soon extended their lead even further as Vanuatu international Kensi Tangis added a sixth. A second penalty for Madang was awarded in the 84th minute giving them a third after Nigel Malagian sent the keeper diving the wrong way. There was still time for one final effort from Central with Miguel Estay firing in a late one. “It would have been preferable if we hadn’t conceded two penalties,” Klosek said. Francis Moyap, Madang FC coach, said given the lead-in time for his team, that they manged to score some goals against a much favoured side was a positive. “We have a young squad and for many of them this is their first major senior international so getting three goals against Tahiti is a feat in itself for us. “When we held the ball and started playing the one-two passes we looked good, we just have to try and maintain that level for the entire match,” Moyap said. In the evening’s second encounter the opening strike again came within the first five minutes. This time it was the group hosts Magenta benefiting from an early set piece as Nicolas Marin struck a dead ball perfectly to lift it over the wall and past keeper Faalavelave Matangi into the top left corner. The home side held the lead for around 20 minutes before Cerbal Khouchaba threw a spanner in the works with a well-struck shot caught goalkeeper Jelen Ixoee by surprise. Before the half could come to a close, Yorick Hnautra hit a perfect low drive through a sea of defenders and into the back of the net to give Magenta a narrow one-goal lead. There were a couple of scary moments for Magenta in the second half but a solid performance from the backline helped them keep their advantage right up until the fnal whistle. “Given that it’s a short competition with three important matches to played, every single one of them is important to win,” Magenta’s Alain Moizan said. Lupe Ole Soaga coach Paul Ualesi conceded Magenta was the better side, but believed his side had a merit-worthy performance of their own. “First of all congratulations to Magenta for the win, I think they deserved it,” he said. “My players tried really hard to beat this New Caledonia opponent but they’re a really hard opponent. The first three minutes of the game a simple goal cost us and we shouldn’t have let it happen. The four Group A side’s will return to action on Tuesday when Lupe Ole Soaga play Madang at 5pm followed by the Francophone showdown between Magenta and Central Sport at 8pm.